ClearCare can dramatically reduce time required for billing and payroll. Why? Our Timesheets & Payroll / Billing reports are automatically updated from the point-of-care,and you can make any edits on one screen, right in the report itself. This means no more flipping back and forth between a static report and another page (i.e. the client profile or records) to make edits. Every value in the Timesheets & Payroll / Billing report is editable. A simple click and it’s changed. 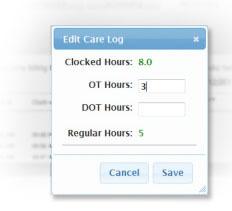 You can also “Add a Care Log” if a caregiver forgets to Clock In via the telephony or tablet.